I received a copy of a new cookbook from the publisher to take a look at: Me, Myself and Pie : Amish Recipes by Sherry Gore. I lived in Indiana for six years, and had easy access to Amish-grown vegetables, Amish-made cheeses and furniture, and Amish pie! There was one restaurant in Northern Indiana, Das Dutchman Essenhaus, that feeds over 1,000 customers a day with Amish cuisine, mostly pie. Why pie? I imagine because it is simple, and there are endless varieties for seasonal fruits. This cookbook is a good representation of the Pennsylvania Dutch recipes, including some very traditional ingredient-stretching recipes like one using dried apples and another using raisins. When I was in sixth grade, I went to Outdoor School at Camp Yamhill. One of the best parts of Outdoor School are the campfire songs, and one of the songs we sang with gusto was about Shoofly Pie, complete with different silly voices and motions. Makes your EYES light up and your stomach say howdy...."
I had no idea what Shoofly pie was, but it was fun to sing about. I can't find a camp version online, but here is a much more sophisticated version. There is another version that I found while poking around the internet, which I will include for your listening enjoyment. So what is this pie, that demands so much attention over the decades? Why are people singing about pie? I've never heard a song about apple pie or banana cream pie. Okay, there is that one song about cherry pie, but I'm not sure that counts. Shoofly pie is a very traditional recipe, a molasses pie. In this version of the recipe (and looking around the internet, I believe this to be pretty close to the traditional recipe), you make a streusel of sorts, then mix half the streusel with an egg and a cup (!) of molasses. Then you top the pie with the remaining streusel before baking. It bakes up into a dense, sticky, almost cookie-dough like consistency. I really liked it, and it reminded me in flavor to the treacle tart I have been known to make for Harry Potter events, only without the complexity of ginger and lemon. This is straight molasses. If you don't like molasses, this is not the pie for you. I was pleasantly surprised. 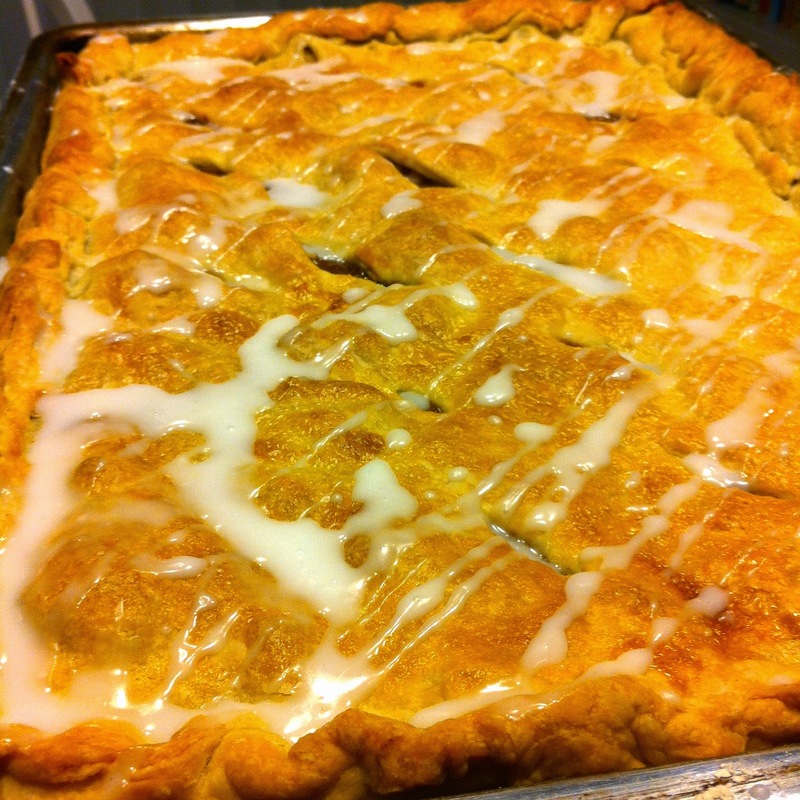 Apple Slab Pie is not a lot to look at. I found the recipe on the Smitten Kitchen blog (follow link for recipe) and wouldn't change a thing - the crust is perfect, the filling is perfect (I used mutsu and shizuka apples). I brushed the top with cream because that's what I had and it browned perfectly. I baked it exactly 45 minutes. Slab pie feeds a crowd. Slab pie uses at least 8 cups of apples (if I were to change anything, mine could easily have used 10 cups!). Slab pie is simple and doesn't require any fancy skills except maybe a light hand with pastry. I'm not sure I'll make regular apple pie anymore. ETA: I did glob on some dulce de leche from a can, on top of the apples before applying the top crust. I'm not sorry!